Adopting a rescue animal from a shelter or rescue provides many benefits. Not only for you, but for the animal shelter or rescue, by allowing them to be able to save more animals. For every dog or cat a shelter or rescue adopts out, they have room for the next animal that needs their help. Adoption fees help to pay for the medical bills for the next animal that needs rescuing too, instead of lining the pockets of puppy mill owners, or backyard breeders. 1. Adopting a rescue animal saves lives. As mentioned above, adopting an animal from a shelter or rescue gives them the resources to continue helping more animals in need. It opens up space in their shelter or foster homes. Adoption fees help pay for shelter upkeep costs, medical bills for the next rescue animals. And you’re helping to keep animal shelters and rescues alive and growing. This country needs more of them, especially No Kill rescues and shelters. 2. Adopting a rescue animal helps end puppy mills, and unethical backyard breeding. But not supporting the people who breed animals for their own greed, you help to put these practices out of business. Turning their potential customers into adopters instead gives them less profits, and thus less reasons to keep up their horrible business practices. 3. Adopting rescue animals helps stop pet overpopulation. Almost all animals adopted from shelters and rescues are already spayed and neutered. Preventing unwanted litters helps control the pet population. Thus helping to stop the needless killing of healthy animals each year. 4. Adopting a rescue pet gives second chances. Most animals end up in the shelters through no fault of their own. A lot of times due to families moving, divorces, new babies, etc. Adopting gives them a second, or sometimes third, chance at having a loving forever home. The dream of all shelter animals. 5. Adoption saves you money. Adopting a rescue pet is by far less expensive than purchasing one fro a breeder or pet store. Most rescue pets are already spayed and neutered upon adoption. Not to mention up to date on all their vaccines. A lot of the adult dogs are even already housebroken and know basic commands and manners. Saving you money, not only on training, but on the possible destruction that untrained dogs are prone too. And the money you’re spending is going to support a charity, instead of lining the pockets of those who breed animals for monetary gain. 6. You know the animal you’re adopting has already been vetted, and received good care. As mentioned above, rescue and shelter animals have already been fully vetted. Most rescues and shelters fully disclose any medical problems that have been diagnosed. 7. Adoption gives you more choices. Puppies and kittens are adorable, and everyone loves them. But not everyone can handle the training it takes to make a puppy or kitten into the perfect companion animal. Rescue animals come in all ages, sizes breeds and temperaments. You have a lot more options to choose from when searching for the perfect pet for you. Looking for a purebred? Over 25% of all animals in the shelters and rescues across the United States are purebred animals. The choices are unlimited when you turn to animal rescues and shelters when looking for your new best friend. 8. 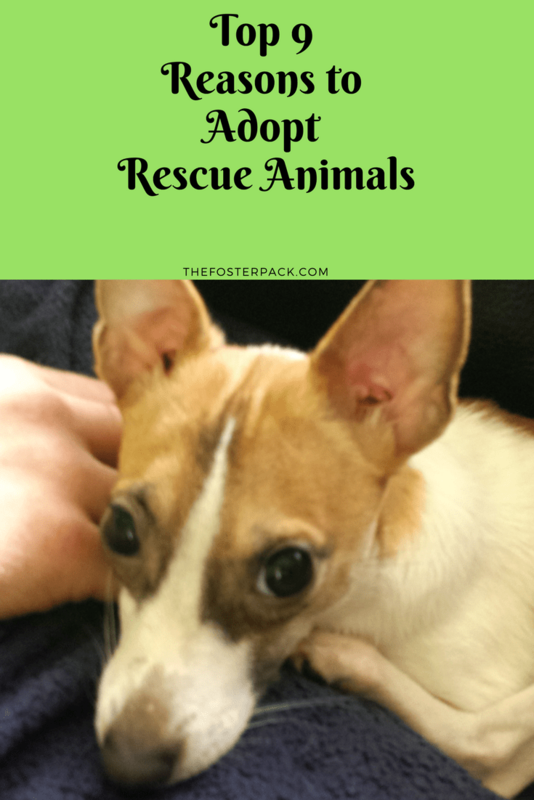 Adopting a rescue animal gives you valuable backup resources. Animal rescues and shelters want to help you to provide a loving forever home. Most are more than willing to impart their knowledge and resources to keep their adopted animals in their new homes. Don’t be afraid to ask! 9. Rescue animal bragging rights. Nothing makes you feel better than telling people you saved a life by adopting a rescue animal. It also encourages others to adopt too! What other reason did you have for adopting a rescue animal?